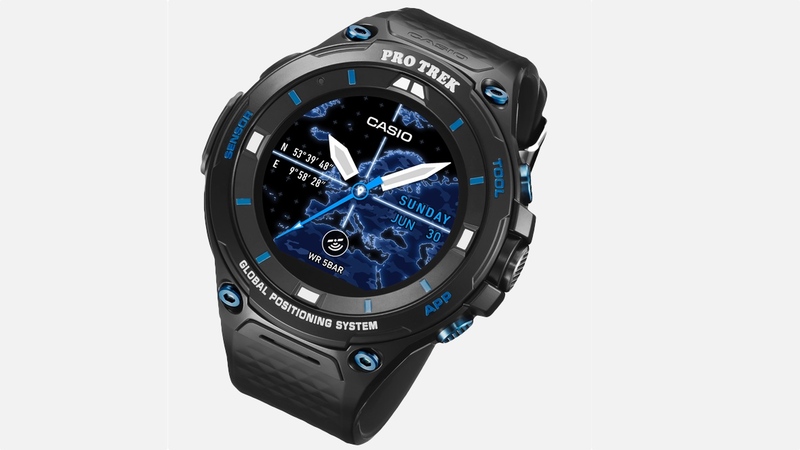 Casio has unveiled its Baselworld 2017 announcements and it includes the unveiling of the Pro Trek Smart WSD-F20S smartwatch. It's essentially the same Android Wear watch as the Pro Trek Smart WSD-F20 announced back in January this year, but now features a new black and blue design with the addition of scratch-resistant sapphire crystal and ion plating on the buttons, screws and buckle hardware. The watch band has also been given a semi-gloss finish. That should give the outdoor smartwatch a more luxurious look and feel compared to the F20. It'll be boxed in a special case with a triangular lid and only 500 of these limited edition models are going to be available. There's no details on when they're going to be up for grabs and how much they're going to cost just yet though. If you need a reminder of the core features, it'll pack a 1.32-inch dual layer LCD 320 x 300 touchscreen display that jumps into monochrome mode when you're running low on battery. The big addition of course is the inclusion of low-power GPS, which was notably missing from Casio's first Android Wear watch. Android Wear 2.0 will be on board so you'll be able to benefit from all the new features including standalone apps and improved fitness features. Casio has a bunch of its own apps specifically designed for adventurers and will support third party apps including ViewRanger, MyRadar and Yamap for hiking. The limited edition smartwatch is going to be on show at the Baselworld watch show, which kicks off this week. Team Wareable will be there to get a closer look at it.